CHARLESTOWN NEVIS (February 23, 2017) — Premier of Nevis and Senior Minister in the Federal Cabinet, the Hon. Vance Amory, is currently in Jamaica attending the February 22 to 24, 10th International Labour Organization Caribbean Labour (ILO) Ministers Meeting at the Jamaica Pegasus Hotel in New Kingston. The theme is “Realizing Decent Work Under the 2030 Agenda”. This year’s meeting is providing an opportunity for exchange on the continuing challenge to promote a more inclusive and sustainable growth process with more and better jobs. It will also allow labour ministers in the Caribbean, to articulate and share their perspectives around the future of work, drawing from the national level dialogues that have occurred in the past year. The forum addresses two pertinent areas: elevating Decent Work to the National and Regional Policy level through social partnership – experiences in the region and a proposed way forward, and instruments and practical tools for Decent Work. Premier Amory, who is also the Minister of Labour, said the meeting brings the ministers together to discuss the work agenda and the millennium goals, which deal with decent work for the people of the region. The Labour Minister recapped the previous day’s proceedings and said the meeting is going well. “We had a full discussion on decent work of which we had three panelists, who put forth their own countries perspectives, but also looked generally at what the decent work agenda is. “The second session dealt with good governance and work, and I think that for us, is a very critical area because it is important that we see good governance as beginning with people understanding their role in the workplace, and employers understanding their responsibility in managing the workforce, whether in government or the private sector,” he said. Minister Amory said that the discussions also recognized the need for people to understand the rules and conditions of employment, both in the private and public sectors, as well as plans for the future of work organizations. “I think that is very interesting because it means we now have to look at how do we plan for the future, how do we plan to create employment, how do we plan to ensure that our people are prepared for the world of work and to work effectively for the improvement in the economic development of our country and longevity in the place of work as well,” he said. St. Kitts and Nevis and Trinidad are currently undergoing a process of Labour Law Reform in the Caribbean. On that basis, Mr. Amory will make a presentation as part of the Law Reform Panel on the process on Thursday, February 23. 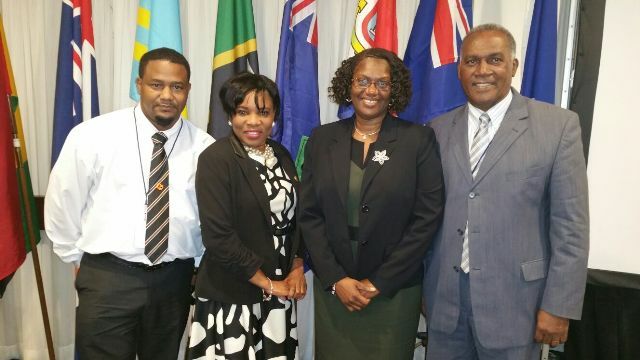 Minister Amory is accompanied by Shernel James, Labour Commissioner, Gary Liburd, Chief Labour Officer in Nevis and Rhonda Nisbett-Browne, Senior Legal Counsel in the Nevis Island Administration (NIA).